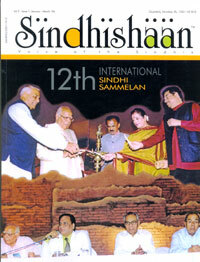 Accept my heartiest congratulations for organizing such a nice '12th International Sindhi Sammelan'. Definitely it was a roaring success. Hats off to you and Ram Jawhrani for such a nice event. Such Sammelans shall unite the Sindhis all over the Globe. Like pearls in a string, in a thread of unity, Sindhyat and I am sure the caravan of Sindhi culture, language, civilization shall move on and on!! Convey my Happy sentiments and healthy remarks to Ram Jawhrani also. Convey my love for your son Amit Butani. I bow my head to all of you! !